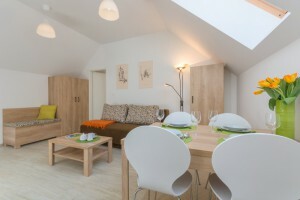 The ground floor double/twin room opens onto a common outdoor patio and is a perfect place for singles, friends or couples looking to stay in the very center of Ljubljana. Ideal for couples, families with children or friends this 40 m² apartment has a separate bedroom and fully equipped kitchen and can accommodate up to 5 persons. This apartment of 33 m² with a separate bedroom and kitchen is located on the ground floor. It opens onto a common outdoor patio where you can relax in the center of town.